Head over to get the Nintendo 2DS in Blue or Red for ONLY $79 (Retail $129.96)! 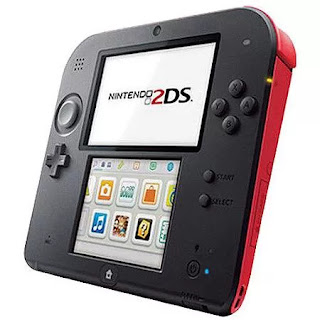 The Nintendo 2DS Handheld Video Game System lets you enjoy all the features of the popular DS and 3DS systems in a single compact device. This handheld gaming system plays both Nintendo DS and Nintendo 3DS games all in a 2D format. Now you can have one device to play all your DS games on without the added expense of 3D. This Nintendo DS includes an AC adapter, stylus, 4GB SDHC memory card and six AR cards preinstalled featuring action-packed Nintendo DS games for kids. It also allows users to take digital photos using the built-in camera. The Nintendo DS console, electric blue uses an integrated Li-on battery that is rechargeable.